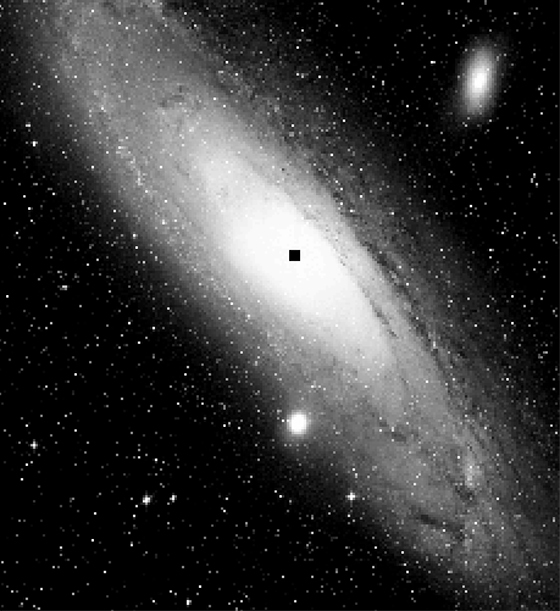 This Chandra X-ray image shows the central portion of the Andromeda Galaxy. 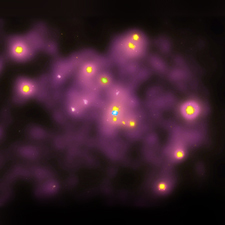 The blue dot in the center of the image is an unusually "cool" million degree X-ray source of unknown nature. Just above this cool source is a source (yellow) that is thought to be due to X-rays from matter swirling toward a supermassive black hole in the nucleus of the galaxy. This black hole contains the mass of 30 million suns. Numerous other X-ray sources are also apparent. Most of these are probably due to X-ray binary systems, in which a neutron star or black hole is in a close orbit around a normal star. Coordinates (J2000) RA 00h 40m 27s | Dec +40° 40' 12"